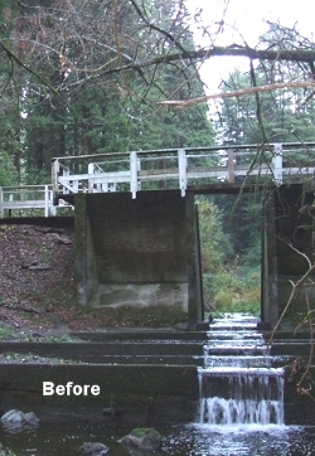 Removing the dam structure to allow spawning gravel and sediment transport and provide effective fish passage for a broad spectrum of salmonid lifestages and replacement with a pre-engineered pedestrian bridge. Ensuring the structural integrity of adjacent structures and nearby infrastructure, including the overall slope stability of the adjacent developed community. Ensuring that the channel continued to have sufficient hydraulic capacity for normal and high creek flows without increasing the risk of flood damage to structures or property. Creating a stable repair within the greater geomorphic and sediment transport dynamics of the stream. Restoring ecological/biological integrity and functions of the project site. Feasible design alternatives were developed through evaluation of the hydraulic, geomorphic and geotechnical conditions of the creek, stream banks and adjacent area. The structural condition of the dam was also addressed. Questa completed the conceptual plan, preliminary engineering design, CEQA document and all regulatory permits, and prepared construction documents. Questa also completed the Geotechnical Investigation for the project and provided construction management and materials testing and inspection services during project construction.